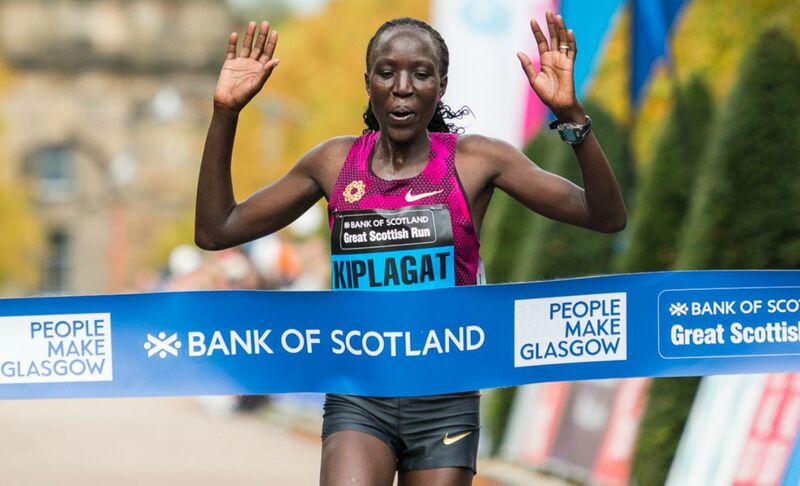 Uganda’s Moses Kipsiro held off Scotland’s Callum Hawkins and Kenya’s Japhet Korir to win the Bank of Scotland Great Scottish Run in Glasgow on Sunday (October 4), reports Mark Woods. Kilbarchan’s Hawkins, currently gearing up for his forthcoming marathon debut in Frankfurt, tracked the reigning Commonwealth 10,000m champion for most of the half-marathon event. But 29-year-old Kipsiro pulled away over the final three miles to take victory in 62:18, 24 seconds ahead of Hawkins who ran a personal best. Kenya’s Edna Kiplagat successfully defended her women’s title in 68:21, with the two-time world marathon champion bouncing back to form after coming fifth in the World Championships marathon in Beijing. Her fellow Kenyan Doris Changeiywo was 91 seconds adrift after making a decisive late break to win her personal duel with Gemma Steel. Jo Pavey was fourth in 69:58, a time which smashes the 28-year-old UK over-40 half-marathon best of 71:44 and is not far off the world masters record. Simon Lawson went one better than his recent effort at the Morrison’s Great North Run by winning the men’s wheelchair race in 23:33, while Sammi Kinghorn warmed up for her four-pronged tilt at this month’s IPC World Championships in Doha by landing the women’s title for the second time in 28:44. Ben Stevenson and Jenny Bannerman won the men’s and women’s 10km titles.